How to Choose the Best Washing Machine? A washing machine is a must-have appliance and significantly adds to your convenience. It helps speed up the wash times while eliminating most of the intensive manual work involved in cleaning your laundry. Different homes have different requirements of washing machines. Front-Loading Washing Machine: As the name suggests, these washers are loaded from the front and not the top. This type of washer has large washing capacity. These washing machines are also found to be better in cleaning performance. They offer better energy efficiency, consume lesser water, and have higher spin speeds. Top-Loading Washing Machine: As the name suggests, these washers have a top-loading design. They are ideal for those who don’t want to bend to put in and take out the laundry. Ease of use is one of the main reasons for choosing them. Some washers may also allow you to add laundry during the cycle. These washers also have shorter wash cycles. What to Look For in a Washing Machine while buying? Laundry Capacity: This is the most basic factor to consider and depends on the size of your family. If you have a small family, choose a washer with 4 to 8 lbs of laundry capacity. A larger family should choose a washer that can handle more laundry per load. Programs & Functions: You should consider the programs and functions based on the level of convenience you need. 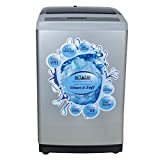 This can include different settings for cotton, wool and other fabrics, quick wash options, pre-wash button, extra rinsing, special color programs, sports cycles, temperature control and much more. Spin Speed: You should also consider the spin speed of the washer. Faster speeds help in getting the clothes drier faster and thus save time, but slower speeds also mean lesser wrinkles. You can find washing machines with speeds ranging from 800 rpm to 1200 rpm. Some models also feature speeds up to 1400 rpm or 1800 rpm. Energy Efficiency: An increasing number of people are becoming more energy conscious than ever before. If you need a washing machine with higher energy efficiency, look for the one with higher energy ratings. A washer with higher efficiency will also consume lesser amount of water. Lifespan: Look for a washing machine that lasts longer. The lifespan of such goods is measured in terms of minimum time to failure (MTF), measured in terms of hours. Look for a unit with maximum possible operational life. IFB: It is among the most popular global washing machine brands. Its stands out for its innovative design, high reliability and a wide range of features. Whirlpool: Some of the most advanced Whirlpool washing machines have advanced features like gentle wave-motion, load detection sensor, tumbling cycle, and water-jet washing. The washers also stand out for their silent operation. Electrolux: Another popular brand, Electrolux has been in business since the early 20th century and offers innovative washing machines at reasonable prices. LG: You can never go wrong with an LG washing machine. Its washers are designed for high performance and come with unique features. Kenmore: This brand specializes in using higher efficiency materials and has emerged as one of the leading best-sellers in the segment. Operating since early 20th century, Kenmore specifically specializes in making washing machines.